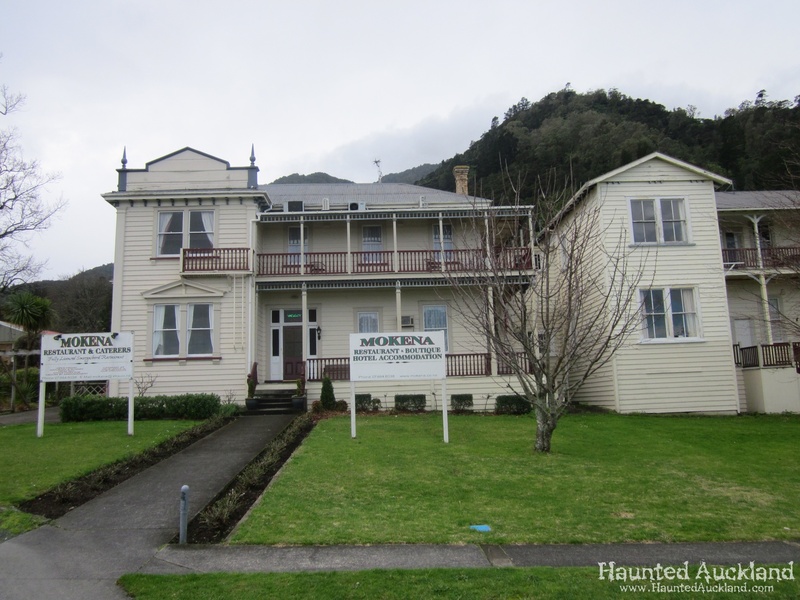 Haunted Auckland journeys to the historic and vibrant Spa town of Te Aroha to investigate the paranormal claims at this scenic hotel. 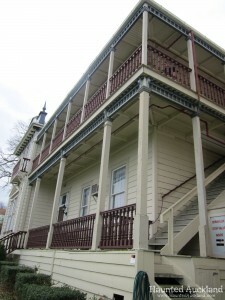 Mokena Hotel was originally named Hinemoa House and was a boarding house during the gold rush of the 1860s in the gold mining township of nearby Waiorongomai. It was moved to Te Aroha in the early 1900s and alterations made to the building in 1927 resulted in the Mokena House we see today. Mokena is a charming building. While it retains the history and character of the original building it has been transformed into a boutique 10 bedroomed hotel with a magnificent buffet restaurant. Members of Haunted Auckland (Mark, Matthew and Barbara) arrived mid afternoon and were met by Diane (Owner/Manager) who was extremely welcoming and helpful. 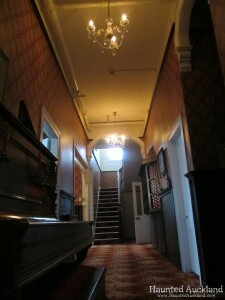 She showed us to our very comfortable rooms and then gave us a tour of the historic hotel. 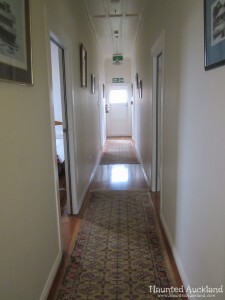 Areas of interest were pointed out including a room near the restaurant where several mediums had reported sensing the spirits of Maori children. Interestingly, this room is where children visiting the hotel usually sit and play or watch TV. We were also shown the closed off renovation/storage/laundry area of the house which is not open to the public but where we decided we needed to investigate further. Later Diane also invited us to walk through her managers flat and take photos. After this we were able to look around the local areas including the Te Aroha Domain, Te Aroha Spa Baths, Mokena Geyser and the Grand Hotel. We later regrouped at Mokena for a delicious dinner and to meet up with Karen, the last member of our group to arrive. She had brought along her son Phoenix, (a budding young paranormal investigator who was about to have one exciting night!) and husband Terry for the weekend. A special Thank you to Mokena for pulling out all the stops for us with our dinner. We were even treated to our own full pavlova and fresh fruit salad for dessert. The extra special effort put on for us was very much appreciated. That kind of genuine hospitality is rare these days, especially back in Auckland. 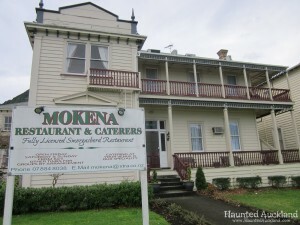 The Haunted Auckland group carried out a Class 3 investigation at Mokena Hotel. Equipment used for the overnight investigation: I.R Cams, standard video cams, Audio recorders, Magnetic Field Generators, Motion detectors, EMF meter, Thermometer, Trap cam, Digital cameras. Each member of our group had a different room in the hotel and as we were the only guests staying there that night we were able to go through all the rooms. We took photos, video and audio recordings in various rooms and corridors. Barbara had an unusual experience while in the Mountain View Room. 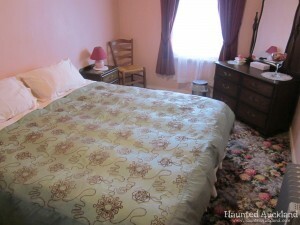 She and Karen were in the room with the lights out doing an EVP session. Barbara felt something fall beside her but could not see what it was in the dark. Upon turning on the light to retrieve whatever it was that had fluttered past her she found an oak leaf at her feet. This could have perhaps been there already but was not noticed earlier in the day when team members went in there during daylight hours and was not in any of the earlier photos. Barbara said she felt it flutter down beside her but has no idea of how it could have come to do that. There was a window in the room but it was closed at the time. There was debate among the team with some members being sure it must have come in on someone’s foot but that does not explain how Barbara had the sensation that something had fluttered past her then found the leaf. Barbara feels this may have been a personal paranormal experience. Matthew based himself in the upstairs lounge and placed his EMF meter there. He did notice an increased reading in the room at one stage during the afternoon. Barbara and Matthew were lucky enough to be allowed to enter the managers accommodation to take photos and audio recordings. Dianne told us of locking doors within the hotel and returning to find them unlocked and vice-versa. Phoenix had an experience while standing in the corridor near the upstairs lounge and the top of the stairwell.He had the sensation that someone pulled on his jacket. Later as he walked past he saw what he described as a “leprechaun” sitting on the stair rail near the top of the stairs. He reported this to his mother and other members of the group and photos and E.V.Ps were taken but nothing unusual was found. We also had a motion sensor Trap camera set up at the top of the stairs to capture any activity in that area as we investigated downstairs. We were unfortunately unable to do a thorough investigation of the restaurant due to a function being held there during our visit. It was not accessible later in the evening so the group was only able to take a few photos and do a short audio recording while the room was being set up. Upon review nothing was found in these photos or recordings. This part of the hotel was under renovation. It was used mainly for storage, but the manager’s office and laundry were also in this area and this was the area used for a Halloween Fright Night Evening Event held at the hotel. The wing was much colder than the rest of the hotel but this may have been because it was not carpeted and most other areas of the hotel were. Our group took numerous photos, videos and audio recordings in this area both through the afternoon and later in the evening. She was in a hallway putting linen away in the cupboard. On opening the cupboard she noticed that things had been moved around from shelf to shelf. She said she notices this happening quite regularly and as she is the only one in the hotel that ever uses or goes in the closet, she felt it was strange. She mentioned to me that she has told the ‘culprits’ to “*$%# off and stop messing in her area” numerous times as it had become a great annoyance having to tidy up the mess so often. Diane had told us that people had told her that there were spirits of children in the TV lounge so the group spent time in there during the afternoon and in the evening. 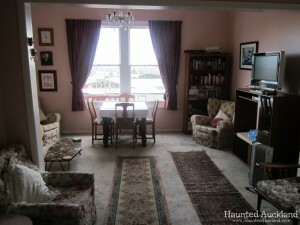 This room became our base in the late evening when we set up infra-red and motion detection cameras there. We held various EVP sessions and experimented with white noise while attempting to communicate with any spirits which may have been there. We took numerous photos and hours of audio recordings. No unusual readings from the meters or recording equipment, though the incident in the downstairs entertainment room where we conducted the communication session had us guessing for a moment. A motion sensing light kept lighting up at intervals. It was aimed at a wall with a gap of about 20cm, so no one would be setting it off with their movements by being in front of the sensor. It seemed to flash on in response to our questions, but we decided after a while that due to its regularity and constant timing, that it may have been caused to a glitch or fault in the motion detector itself. 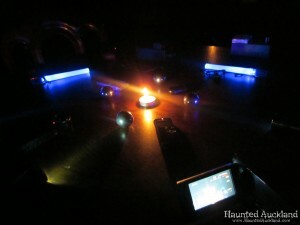 Trigger Tests – We set up large ball bearings, magnets, balloons, motion sensors, candles, as well as using objects on the table during the séance / communication session. No results from our trigger objects. Séance – We held a short communication session whilst in the T.V lounge. Mark comments, “I have sat in on a séance before many years ago and at the time wasn’t convinced it was anything more than just the power of suggestion in play. As we didn’t receive any answers or activity during the Mokena séance, I can’t really offer any better opinions than my last one. I am still undecided as to whether there is anything paranormal behind séances”. The team at Haunted Auckland took over 1000 photos, and many hours of video and audio recordings. Upon reviewing all this we did discover several photos which had possible anomalies. Eventually all were eliminated except one which we cannot offer a good explanation for. This was a photo taken by Karen whilst we were setting up in the TV lounge getting ready for the night ahead. It shows a strange white ‘mist’ around the edge of the table. Captured in the Children’s Room at Mokena, a white mist can be seen above the table as we set up our equipment. 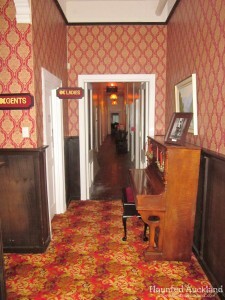 It is hard to deny or dismiss the many years of experiences by staff and customers that have visited and occupied the building in the hotel’s long history. There were so many exciting stories, some in great detail and many telling of obvious physical activity that they can’t all be cast off as being just urban legend or misidentification. Whether there is something ‘intelligent’, residual or otherwise, the Mokena Hotel is one beautiful old hotel that has been lovingly cared for many generations. She’s an old bird with much character and charm and we’re quite confident her walls hold many secrets. who knows, next time we visit her, she may just feel like sharing some of them! A big thank you to everyone at Mokena for being such superb hosts and making our stay such a pleasure. We’ll be back for sure and if you’re ever passing through Te Aroha, stop in and say Hi and tell them Haunted Auckland sent you!